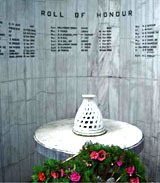 The foundation is established in the memory of Flight Lieutenant Maheesh Trikha, who gave his life for the motherland and became a Martyr during operations Meghdoot & Parakram while on an operational sortie in a Cheetah Helicopter of 114 Helicopter Unit of the Indian Air Force at Siachen Glacier, the highest battlefield in the world. The foundation salutes the individuals like Maheesh who make the supreme sacrifice of their lives to uphold the dignity of the country. The Foundation is registered as a Charitable Trust under Indian Trusts Act vide Registration No: 6,232,book no IV, Volume no 2845 dated 05th July 2006 at Mehrauli at the office of Sub Registrar, Delhi. All donations are exempt under Section 80 G (5) (vi) of the Income Tax Act, 1961 vide their Order No. D.I.T(E) / 80G /2011-2012/ 208 / dated 11 Oct 2011.